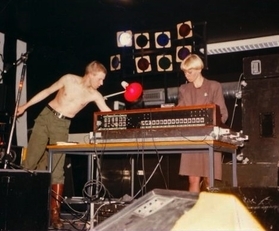 Club Moral was founded by Anne-Mie Van Kerckhoven (AMVK) and Danny Devos (DDV) in Antwerp on January 1st, 1981. From 1981 until 1987 Club Moral acted as a venue and until today as a music performance band. They have become known for their controversial performances and imagery because they focused on the presentation of art and live events of an extreme nature. Acts that have performed at Club Moral have included Non (Boyd Rice), Coup de Grace (Michael Moynihan), Slave State, Gerechtigkeits Liga, John Duncan, Angst, ProduKtion and many many more. Numerous exhibitions, performances, concerts, lectures and film-shows were held. From 1983-2005 they also published 16 issues of the Force Mental Magazine with numerous international contributions on art, music, radical journalism, photography, literature and poetry Almost 100 different cassettes of bands that performed in Antwerpen found release on their self-run Club Moral-Label. This Box-Release should give an audio- and visual overview and insight into the work of and at Club Moral and their two protagonists, DDV and AMVK. It will take you beyond the highly sought after Vinyl-Release of „To All Who Are Interested“ from 1989 and will focus on the very early stage of Club Moral’s work including acclaimed pieces of close friends and collaborators.